“Shinkansen daibakuha” or The Bullet Train is Japan’s version of the 1970’s Hollywood disaster picture era (for example, see Earthquake 1974). This two hour adventure has you on the edge of your seat and its premise (there’s a bomb on the train!) was the inspiration for the more well-known 1994 movie, Speed. Generally, I’ve not reviewed foreign films on this blog, but “Bullet” is pretty good. The story moves right along and it proves the folks from Japan can overact with great facial contortions as well as any American disaster film. Truly world-class carpet chewing. Let’s check it out! Helicopter shot of the Shinkansen racing through rice paddies somewhere in Japan. Filmed just before Steadicams became available and thus the camera was bouncing along madly adding to the “danger” feel of the movie. Overall view of Tokyo’s Central Station with views of the old depot, commuter rail stock, and bullet trains lined up ready to go. Tea time! Enjoying a little brew as they roll out of Tokyo; Heading towards 210 kilometers per hour (130 miles per hour). At the time (this was pre-TGV French high speed trains), Japan had the fastest passenger trains in the world. The Shinkansen had been running since 1964 and wiki has quite an interesting history about the line. Indeed, looking like a bullet, Train 109 races along; The cute JNR switchboard operator gets the bad news that there’s a bomb on the train. JNR’s Security Chief is about to choke on his drink as the cute operator relays the mad bomber’s call; Train 109 hurtles through an electrified urban millieu. Flashback to a telephoto shot of a steam-powered freight trundling along; Cab view of steam engine 9634. Both engineer and fireman make great faces as they calmly discuss their train’s condition (towerman notified them there’s a bomb aboard their freight as well). Jump! Both enginemen “join the birds” as their train slows down; KA-BOOM! As the freight slows to a certain speed, the bomb goes off. Apparently, this was the mad bomber’s “dry run” for the ill-fated Shinkansen 109. OK, back to the Bullet Train. 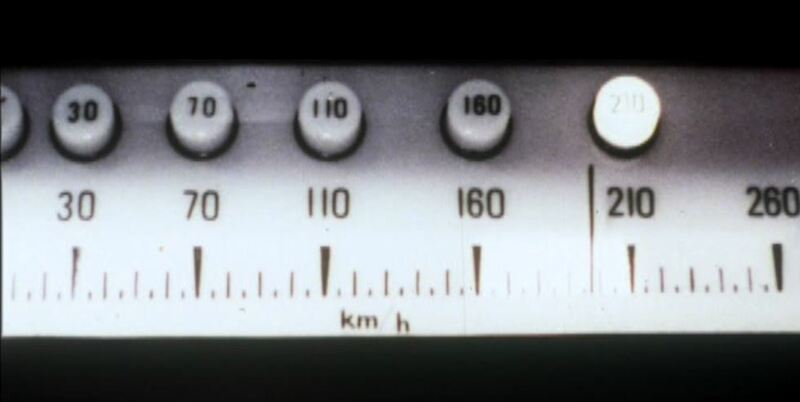 The engine crew hears from the dispatcher that not only is their train rigged to blow up if their speed drops below 90 kph, but they’ve got to perform a tricky crossover manuever with an opposing train. This just isn’t their day; Nice shot of Shinkansen emerging from a tunnel onto a bridge. Cab view of the oncoming train; Crossing over JUST as the other train clears. Banzai! Jubilation at the dispatch center; Passing through Nagoya, Shinkansen 109 doesn’t stop (remember it’s boom-time if speed drops below 90km). This does NOT sit well with the passengers who wanted to get off there. Ahhhhhh! Another cute chick goes berserk; The passengers are beginning to panic! Gradually the folks onboard figure out that not only is the train not stopping, but there’s a BOMB onboard! Hilarity ensues. MUCH elaborate ransom payment and non-train stuff left off here. Back to the action. Obligatory shots of one of the mad bombers (there’s a gang) hoofing it down the tracks with the cops in hot pursuit. Night Time on the City of New Orleans…; One of the dispatchers keeps having unpleasant visions of the Shinkansen 109 going kablooey. Did I mention? One of the gang is in police custody onboard, gets loose, goes berserk, grabs a cute hostess and threatens the kitchen staff with a carving knife. Emeril he ain’t; GREAT, clenched-teeth shot of yet another distraught passenger. Two bullets are better than one; Hmmm…how shall I end this? How about with eyeball guy staring at some wires? Creepy, huh? Anyways, it was a most enjoyable picture and a fairly decent story, IMHO. Several red herrings and false leads as the film goes along. My print was pretty grainy and the English dubbing so-so, but there’s enough action throughout to get the idea of what’s going on. Sayonara! 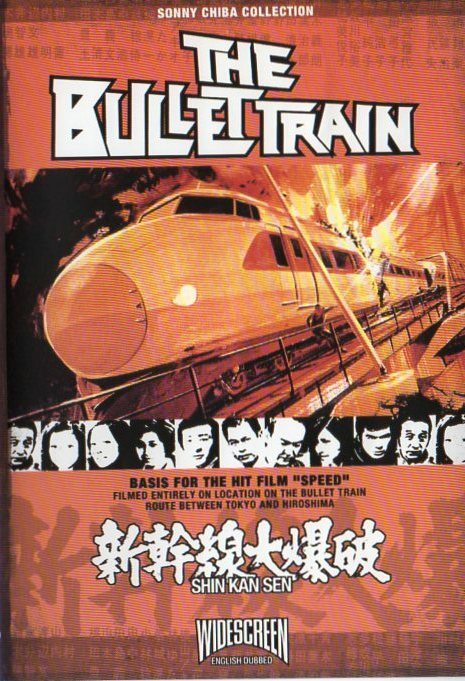 This entry was posted in Uncategorized and tagged Bullet Train, Disaster Movie, High Speed Trains, Japanese National Railways, Shinkansen, Steam Locomotive, The Bullet Train 1975. Bookmark the permalink. Seems like a really fun film. You keep adding movies faster than I can watch them! Funnily enough, the anime “Case Closed” (aka “Detective Conan”), had a similar premise in an early episode, albeit with a time bomb.